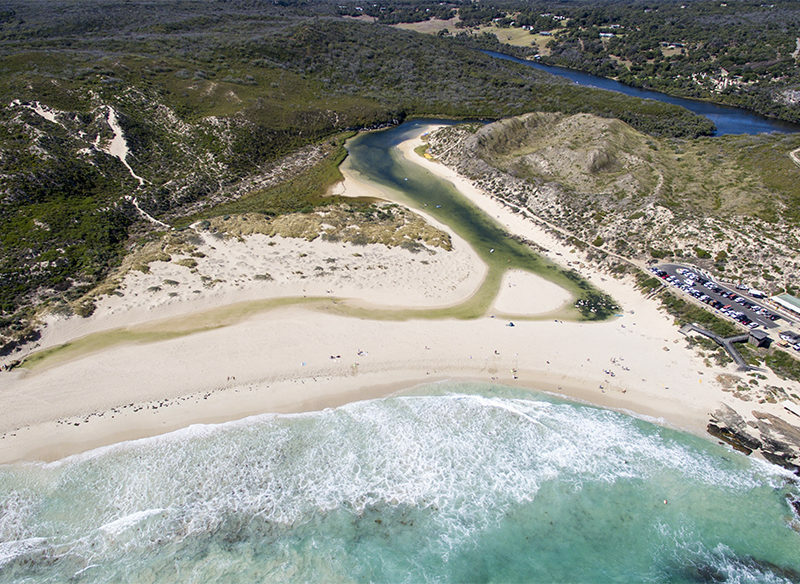 Western Australia’s beloved south-coast holiday spot, Margaret River, is world renowned for its premium wine, mouth-watering produce, white sandy beaches and amazing surf breaks, writes Dimity Noble. Need any more excuses to go? the fresh local produce is so popular that there’s not much left to export beyond the region. Expansion is often avoided for fear of losing quality control. 2 While just three per cent of the country’s grapes are grown here, it is responsible for 20 per cent of Australia’s premium wines. Cellar-door staff are friendly and informative, so get a wine education while on holiday. 3 The beaches are seriously beautiful. You are spoilt for choice with so many heavenly places such as Meelup, Boodjidup, Eagle Bay, Yallingup, Smiths and Injidup. 4 There are so many sporty leisure activities. Dive historic shipwrecks, explore rugged, rocky bays or immerse yourself in crystal-clear waters or thunderous surf. 5 To get back to nature. Take in panoramic ocean views, hill challenges and bush ambience. It would be a challenge to cover them all in one lifetime. The Margaret River region stretches from Cape Naturaliste 110km south to Cape Leeuwin in the south-west corner of WA. Vibrant towns and quaint hamlets are dotted along the majestic rocky coast and in a pretty, vine-studded hinterland featuring karri forest, rugged bush and limestone caves. Why is Margaret River so marvelous? A mild Mediterranean climate makes for a great year-round holiday destination. While a trip could concentrate solely on food and wine – there are more than 100 wineries – adventurous types can choose from countless surf, dive and swimming spots, or explore coastal and inland walking trails. By car: Margaret River township is a three-and-a-half-hour, 270km drive south from Perth along Kwinana Freeway and Forrest Highway. Fill up on fuel in Perth as you won’t spot a petrol station until you get near Bunbury. For a more scenic drive, take the longer, inland South Western Highway. South West Coach Lines operates a daily bus service from Perth. The trip is about four-and-a-half hours. There’s an extra service from the city on weekends and public/school holidays. For timetables, visit www.veoliatransportwa.com.au. By air: If you can afford a charter flight, Axiom Aviation (www.axiomaviation.com.au) operates same-day return trips out of Perth for up to four people for about $1452 each (it’s a one-hour flight). There are landing strips at Busselton and Leeuwin Estate. Known to the locals as ‘Margs’, Margaret River township (population: 5000) is 10km from the Indian Ocean on the banks of the eponymous Margaret River. Most shops, butchers, cafés, restaurants, supermarkets and medical centres are located along the main street, Bussell Highway. The vibe is laid-back. Park at the Shell petrol station and stroll up towards Wallcliffe Road, where the hub peters out. A must-stop for travellers is Margaret River Visitor Centre (100 Bussell Highway; www.margaretriver.com), where you can stock up on free maps and brochures galore. If you’re in the market for a new surfboard, this is the place to get it – surf shops are dotted along the main drag. What to do outside of town? Go for a drive: Two main roads run from cape to cape: Caves Road takes a direct, scenic path close to the coast. Bussell Highway is a little further inland. An arterial network of back roads links wineries, microbreweries and local providores. All are well signposted. Take at least a day to explore – two would be better. Shop in Dunsborough: This bayside town just north of Margaret River is full of unique boutiques and interiors stores. Fantastise about decking out your home with decor from Empire Homewares, Unit 2, 58 Dunn Bay Road. Remedy carries exquisite printed sheet sets, knitted toys and handmade jewellery at Shop 10, 31-33 Dunn Bay Road. For clothing go to Milc, Shop 2, Dunsborough Village Shopping Centre, Naturaliste Terrace. Get arty in Yallingup: In a rural setting overlooking a lake, off Caves Road, south of Yallingup, Gunyulgup Galleries houses a diverse collection of contemporary West Australian art and design (www.gunyulgupgalleries.com.au). The Studio Gallery and Bistro opened here late last year (7 Marrinup Drive, Yallingup; www.thestudiobistro.com.au). Go caving: The appropriately named Caves Road hides a wealth of underground attractions. At Ngilgi Cave, Yallingup, semi-guided tours are available through the day (www.geographebay.com). Mammoth and Lake Caves are south of Margaret River in the Boranup Karri Forest, which lies between Caves Road and the coast. The drive is magical as the sun illuminates the red bark of these trees, which grow to over 60m tall. Jewel Cave, further south, recently underwent a large redevelopment (www.margaretriver.com). Walk off any overindulgence: The 135km Cape to Cape Track is for the truly dedicated, but there are shorter walks along the route (www.capetocapetrack.com.au). From the south end of Smiths Beach, it’s only 2km to Wyadup along cliff tops offer superb coastal views. Go fishing: Head to Geographe Bay between Bunker Bay and Dunsborough if the sea breeze comes in early. Beach and dinghy fishermen can expect to catch squid, whiting and herring here. Other popular spots to throw in a line include Blackwood River, Canal Rocks, Redgate Beach, Hamelin Bay and Skippy Rock. Dive off the jetty: The longest timber-piled jetty in the southern hemisphere, the 1.8km Busselton Jetty reopened in early February after a $27 million refurb. New features include swimming and diving platforms. Best of all, the unique Underwater Observatory has reopened. Access to one of Australia’s most unusual ecotourism sites and greatest artificial reef is no longer limited to divers and snorkellers. Now anyone can marvel at the underwater universe from eight metres below the water’s surface without getting wet. The Margaret River wine region produces internationally acclaimed chardonnay, semillon, sauvignon blanc, riesling, cabernet sauvignon, merlot and shiraz. Empty the car’s boot and plan for a day of tasting and buying. Leeuwin Estate: Internationally recognised for its wines, it also has a great restaurant. If you’re on a budget, take a picnic hamper, roll out a blanket and enjoy the setting. Alfresco concerts are hosted here in summer. Voyager Estate: Wander through the pristine gardens before enjoying a tasting of exclusive, limited-release wines at this stunning Cape Dutch-style cellar door. Clairault: Set among natural bush and vineyards. The stylish restaurant impresses with mod-Oz dishes. Cullen Wines: Take an outside table at the restaurant here, among the vines of this biodynamic vineyard. Vasse Felix: Houses the Holmes à Court art collection, and the restaurant has won numerous prestigious awards. Hayshed Hill Winery: The café here offers benchmark Australian and international cheeses and gourmet deli supplies. Stay for lunch on the balcony overlooking Wilyabrup valley. Kids can play cricket or boules on the lawn below – the equipment is free to use. Knee deep: Grab a stool and sit up at the bar for tastings, or sit out on the verandah and enjoy a delicious lunch. The vines are within arm’s reach. Will’s Domain: Owned by Darren Haunold, whose ancestors were making wine in Austria back in the 14th century. Take in an art exhibition, enjoy an insightful tasting, then linger over a signature tasting plate. Wine may be Margaret River’s most revered liquid asset, but beer lovers are increasingly well catered to. Eagle Bay Brewing Companies: Sit outside and catch glimpses of the ocean at this family-run boutique brewery. Colonial Brewing Company: A popular family destination with a relaxing indoor/outdoor setting. Cowaramup Brewing Company: Set in beautiful garden surrounds with a great kids’ playground. The Urban Bean: Margaret River town centre is lined with cafés, and this place packs coffee with punch. Margaret River Bakery: If the kids are in tow, head to this place just near the Shell petrol station and take your snacks over to Rotary Park. This shady riverside location has excellent picnic and barbecue facilities. Winos: With a sophisticated setting despite its name, this ambient wine bar is easy to miss as the façade is covered in vines. Select from local wines complemented by tapas dishes. Open from 2pm to 11pm. Must Margaret River: An intimate place to splurge on dinner. Its aged beef will have you making return visits. The Cape Wine Bar: On a warm evening, request an outdoor table here. Sample simple but delicious tasting plates and a unique collection of wines. Food Farmacy: This innovative restaurant serves local ingredients with creativity. It’s pricey, but worth the splurge. Cheffy’s: Near the car park at Yallingup Beach, this place serves decent burgers and fish and chips. Relax on the grass and watch the sunset. Farm-gate shops sell local olive oil, cheese, meats, nuts, chocolate, ice-cream and bread. Take an esky or cool bag and be sure to work backwards from 4pm, when you should be hitting one particular Yallingup bakery. Yallingup Woodfired Bread: The smell of up to 400 loaves wafts from this bakery’s volcanic-stone ovens at 4pm. No-one reaches their car without tearing off the warm, robust crust. Margaret River Venison: Try the sensational venison sausages infused with a dollop of red from nearby Edwards winery. 5103 Caves Road; www.mrvenison.com. Providore: This is a great place to stop because it combines vineyards and olive groves with kitchen gardens, a gourmet shop and café. 448 Harmans South Road, Wilyabrup; www.providore.com.au. The Margaret River Chocolate Company: Need we say more? It’s conveniently next door to Providore. www.chocolatefactory.com.au. Margaret River Farmers’ Market: Held twice a month on Saturdays (April 9 & 23, May 14 & 28). Pick up seasonal produce direct from the growers. Vasse Markets: Held the first and third Saturday of every month from 7.30am till noon, in and around the Vasse Hall. Fruit and veg are sold here, but you’ll leave with items you had no intention of buying: delightful kids’ aprons made from vintage fabrics, wrapping paper, cards and the world’s best ginger fudge. Kaloorup Road, Vasse. The region is a world-renowned surf haven, showcasing some of the most consistently spectacular surf. With over 50 breaks peppered along the coastline, you’ll find one to suit most skill levels. Surfers Point: The break off a headland near Prevelly is a must. Its massive swell hosts up to 200 of the world’s top surf pros for the Margaret River Drug Aware Pro surfing competition each April. Just south in Prevelly Park you will find a protected beach, a jetty for fishing and a pontoon in the summer. Cape Naturaliste: Popular surf spots include Windmills (ideal for the less experienced surfer), Three Bears (for the more experienced) and Shallows, a sand-covered reef break that’s great for all levels. Smiths Beach: typifies the coastline: golden sand backed by slopes rising into the national park, with multiple walking trails. The southern corner offers sheltered conditions, a small lagoon and easy swimming. Yallingup Beach: has protected lagoons enclosed by reef formations: ideal nooks to bathe with young kids. Quieter Injidup Beach is sublime. Gracetown: south from Yallingup has conditions perfect for snorkelling. Redgate Beach: is even further south, with great surf, rocks and sheltered areas. Hop on a horse: The Horse Resort offers guided rides for all levels through rolling paddocks, dams, creeks and forest. Get lost: Wander around a giant hedge maze in landscaped gardens with free barbecue and playground facilities at Amaze’n Margaret River. Visit the cold-bloods at Naturaliste Reptile Park, cnr Bussell Highway and Wildwood Road, Carbunup, or go to the birds at Metricup Bird Park, Metricup Road, off Bussell Highway. *GIVE THEM A TREAT: Simmo’s Ice Cream has more than 100 flavours and a fantastic grassed playground. In addition to the places listed below, you can find more mid-range and affordable accommodation options at www.margaretriver.com. Check out www.privateprop.com for deluxe holiday house rentals in the region. Gracetown Caravan Park: Enjoy the peaceful bushland setting just 2.5km from the beach. Superior cabins for two are in the range $100-$200. Yallingup Beach Holiday Park: There are knockout views here. Walk to the beach, or enjoy sunsets from your cabin porch. Van/tent sites cost from $10 to $20, whilst ensuite cabins for two range from $115 to $260.